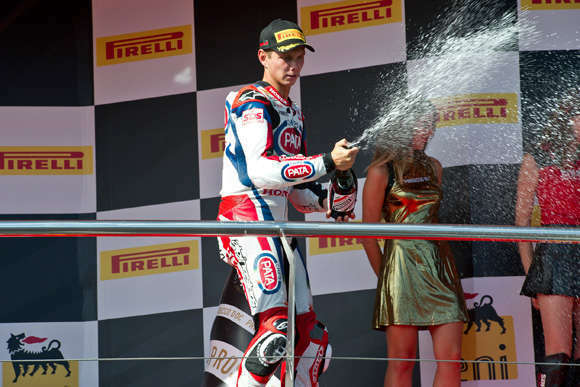 Michael van der Mark took the third podium of his rookie World Superbike championship season today, taking his Honda CBR1000RR Fireblade SP to third place in the first race of round 11 of the series at Jerez in Spain. The race was won by Tom Sykes. Starting from fourth place on the grid, van der Mark dropped a position going into turn one but never lost touch with the leaders. By mid-race, the 22-year-old had passed Jonathan Rea, who finished fourth to secure the 2015 World Superbike championship title. It was van der Mark’s first podium since he doubled up at Assen in the Netherlands in April and in this afternoon’s second race he looked to be on his way to another double podium. He had fought his way up to fourth place and was challenging Leon Haslam for the final podium position when he crashed unhurt at turn six. Van der Mark was able to right his lightly-damaged CBR and re-join the race, matching the lap times of eventual winer, Chaz Davies. The Dutch rider finished in 13th place to consolidate seventh place in the overall championship standings. Pata Honda team-mate Sylvain Guintoli, meanwhile, was unable to match the pace of van der Mark in today’s two races. The French rider finished 10th in race one and 9th in the second 20-lap outing at the 4.423km Jerez circuit. The Pata Honda team will remain at Jerez for a one-day official test tomorrow before heading back to the workshop in the Netherlands to prepare for the penultimate round of the season at Magny-Cours in France on 2 October. PJ Jacobsen (Core” Motorsport Thailand Honda) earned a second place finish in the FIM Supersport World Championship race at Jerez de la Frontera, Spain, having qualified in third position on the grid. The warm conditions in Spain provided a dry track surface for the 27 competing riders at the 4.423km circuit but from the start Jacobsen had to work hard to stay in contention with eventual race winer Kenan Sofuoglu (Kawasaki). The Turkish rider’s lead waxed and waned through the race, with Jacobsen trying to reach and then pass him, to cut his pre-race points deficit. At the end of 19 intense laps Jacobsen was to finish second, if only 1.037 seconds behind. Jacobsen continued his perfect podiums score of four from four since he joined the Core” Motorsport Thailand Honda team and he moved into second place in the championship, as the third realistic championship contender, Jules Cluzel, suffered a serious leg fracture in practice and missed the race. Jacobsen is now 33 points behind Sofuoglu, with two rounds remaining. Kyle Smith (Pata Honda) had an ultimately positive experience at his adopted home round, with the Spanish resident British rider finishing fourth and moving to within eight points of fifth place, despite experiencing some issues in the early laps with a full fuel load onboard. Smith had to fight to keep his position at that stage but was a clear fourth at the flag after he picked up some pace. He was more than four seconds up on Cluzel’s late replacement, Nico Terol (MV Agusta). A season best ninth place for Kevin Wahr (SMS Racing Honda) saw him improve one position in the overall championship fight, from 17th to 18th, going from 16th to a deserved finish inside the top ten. A sometimes-dramatic race saw Roberto Rolfo (Team Lorini Honda) run off track and drop back to 21st place at one stage, after experiencing some issues with his braking system’s consistency. The experienced rider managed the situation well to move back to tenth place, the same position he had qualified in. Rolfo’s team-mate Marcos Ramirez was 12th on his Team Lorini Honda, heading up Australian Aiden Wagner (CIA Landlords Insurance Honda) and Colombian Martin Cardenas (CIA Landlords Insurance Honda), in 13th and 14th places respectively. The latter had his own dramatic race going from 12th to 21st and back to 14th after his ignition was shut off inadvertently for a time. Wild card rider Janos Chrobak (Schmidt Racing Honda) placed 15th and took the last point on offer, while series regular Glenn Scott (AARK Racing Honda) was 16th and just missed out. Gino Rea (CIA Landlords Insurance Honda) was forced off track at one stage and then fell as he tried to get back into contention, no scoring but maintaining his overall fifth position in the points. The next round of the championship at Magny-Cours in France, on Sunday 4th October is the final one in Europe, before the championship moves on the finale at Losail in Qatar on 18th October.